Update: Scott Sumner has a related post. Lars – I love these takes, especially when you “picture” them! It could be a nice way of slowly changing targets. Keep the IT rule but over the GDP Deflator and later convince everyone it´s even better to target NGDP. and you are not the only one. I confess I am not up on Euro statistics, but now that FT Alphaville linked to your chart, there are people on blogs and so forth trying to defend inclusion of indirect taxes in the price index that the ECB targets. So lets see, govt hikes taxes, and the ECB tightens. Yes, lets make sure fiscally contractionary policy is also monetarily contractionary. Instead of a parachute, lets give the economy a big lead brick. There are no words. Do they not teach supply and demand in econ anymore?? sigh. we really are headed for an EU breakup arent we. The EU HICP includes, what the people pay in the end, and this includes imports and consumption taxes. This is how the normal man on the streets understands it. Many countries have been many times through raising consumption taxes without that being a problem, so why now ? and not as a flow (consumption) via those EU OOH (owner occupied housing) or US OER (owner equivlaent rent) schemes. a) the calculations depends on the existence of timely and accurate HPIs (house price indices) which the people dispute even in the US, and just forget about most of Europe. And you will not see many more consumption taxes (a.k.a. VAT value added taxes) increases. People are already getting creative to get around them. in order to create the pretext for breaking the Maastricht treaty (no bailout, no money printing). against the coming inflation storm, they fear (me too). We dont see it yet, but we smell it. Misleading representations are great to raise the faithful to the cause. But they poison the discussion culture with the other side. Historically this most the times does not lead to a harmonious search for an agreeable common optimum. For generating clicks, at least short term, it is of course much better. If some people think, they can have a MU monetary union, or even some deeper fiscal or transfer union, with one side permanently cheating the other, they are delusional. The result would be breakup, well reasoned hate, and very significant economic damage. Do not let us be like Boris and Ivan's goat. b) Even ECB would be bound by treaty to these improper targets – why do they keep defending them? There is no excuse for this. Imagine that government would establish a committee for preparing Olympic games in some country. The chairman would give interviews and claims but how fantastically everything is proceeding – only when the D day arrives everybody realizes that games are utter failure since nothing is prepared. And the Chairman would defend himself by saying that it is not his fault that nobody in comitee was given signing rights for contracts by government and that “key metrics” such as number of letters written to foreign olympic comitees they do better then other countries that organized games past. Surreal? This is reality for ECB. 1: there are excellent reasons for eliminating import prices and VAT changes from the CPI since they send send wrong signals. the ECB cannot target import prices, those are set on world markets. In fact, the appropriate response to higher import prices is to consume less imports, so the appropriate response is to do nothing or even depreciate the currency to help the adjustment mechanism and trade balance. This is pretty straightforward and well understood stuff and tons has been written on the subject. 2: I don’t see deliberate attempts to give people cause to break the Euro. The ECB and 20% unemployment in Spain and the periphery is giving people cause to break the Euro. Reams was written back in the 1990s about need to have stabilizers to compensate for asymmetric shocks. Krugman is not even original on this, just the most recent economist to state the obvious. 3: Do you have evidence for this? I’d like to see evidence that the breakeven implied by TIPS systematically understates inflation. The Cleveland Fed has done studies and TIPS historically overstates inflation by about 35 bps due to tax treatment and liquidity preference. Right now the 1 yr breakeven implied by TIPS is 1%, 2 yr is 1.4%, 3 yr is 1.6%, 5 yr is 1.85%. Back in Sept 2008 breakeven TIPS inflation predicted deflation while inflationistas were crying inflation! and we had (as predicted by TIPS) deflation. Markets have a far better track record than models, but i’d love to see your evidence. first, great thing that the verbage stays civilized !. as if the ECB would not do its job, and that is at present targeting HICP. and it does this job. The headline with the graph was intentionally misleading, well knowing, that it is just the headline cited somewhere else. the harmonized index of consumer prices. The consumer goes into the supermarket, buys tomatoes, flour, meat. He does not care whether they come from Spain, Italy, USA, and what part of the final price is what kind of taxes. All he sees is the final price. What Scott Sunner didnt understand is only the OER part in his US CPI. This was my argument against including OOH into EU HICP. As somebody argued at kantoos, with the same thrust, “something is not working”, therefore (implicit) breakt the maastricht treaty. The HICP is easy to understand and easy to check for the citizen. It reflects the reality for the people, and they can trust it. This is not the case for the “GDP defl. something”. , I did not mention so far. The differences between the different inflation definitions are actually very minor. The definition is not the ECBs rotten new child, but how the most of us defined that many, many years before. The US PCE, which the FED uses, is much closer to the EU HICP, namly excluding OER, and certainly not to the GDP deflator. Now we could squabble about what ex-Energy means. For the BoE, quite frankly I dont care anymore. They adopted some kind of “inflation targeting” in name only, just about 10 years ago. The HICP target is perfectly valid, and much better than any other suggestion seen so far. For me. For the overwhelming part of Germany. And quite frankly, I doubt it very much that you represent a majority of the people in the other countries. But how do we know ? Do you have information about that ? It is your good democratic right to lobby for a different target. And get a majority in the ECB’s governing Council. Then Germany might have to decide, whether we see it as breach of contract. Until then, of course, everything stays as it is. I tried 2 times to make sense for me of your Olympics examples. Didnt work. Again, the ECB works as it should. at your 1: we are going in circles. Maybe my arguments above for Dubois help you somewhat, maybe my quantitative, detailed arguments against inclusion of OOH at kantoos help you somewhat. when the music stops, and you find out, that now you need only 5 % in construction. Quelle surprise. Nothing new under the sun. Would you continue building homes, nobody needs ? not an expert in this stuff. Germany is full of stabilizers to the roof. Most of that actually going back to the 1920ties (Kurzarbeit). Arbeitszeitkonten, I am sure, was invented by somebody else (Sweden ?). Others are free to copy that. We certainly did not need a Krugman for that. Germany certainly didnt ask for the Euro. And we did make (shyly, some) suggestions for more integration. What is not acceptable, that other decide, how much they need, and we must jsut hand over a blank cheque. @genau11: take your analysis to the extreme: suppose 80% of consumer prices were oil and you are a small open economy. the ECB is tightening when oil price go up. So you are responding to a supply shock with a demand shock. what happens?? yes i understand that HCPI is easier to understand, but the ECB cannot promise to hold down the price of imports. as to 2: there is a lot of literature going back to the 1930s on the link between nominal debt, delinquencies, “safe asset demand” and the banking sector. you cannot ex-post say those homes are or are not “malinvestment” and that “liduidation” is the answer. Even if you suggest this was a “housing finance” supply shock, you do not respond to supply shocks with a demand shock, you just make the system less stable! First order you get your “inflation expectations” just from substracting the treasury from the tips yield, with data taken from e.g. http://www.bloomberg.com/markets/rates-bonds/government-bonds/us/ But then the dance begins. I am holding US and DE (German) treasuries since many years, various maturities, with and without inflation protection. I ll do a lot of systematic calculations, it is my money. I read many years ago the FED papers, about some systematic diffferences (liquidity, and who knows what other “premiums”, ending up with some 0.2 % final residual). And I bought into it, and it worked within the resolution of my checks. I have systematic plots with rates going back to 2005. But this thing went of the rails in Fall 2008. TIPS Implied 5-year US inflation rates was clearly not the “real expectation” anymore, shortly touching minus 0.47% on 11/21/2008, and wildly fluctuating below 0 for a quarter. Now, this you could discuss away as some panic in an extreme situation. I did so too, LOL. The fall to 1.3 % in summer 2010, not anymore. It took me a while to understand it, and this played into my desire to much better understand macroeconomics in the last 2 years. constantly, it is the best you can get. Are you familiar with ISIN identifiers? Do you trade for yourself ? Systematically, calculation driven ? Compare DE000 114152 1 to DE000 103051 8, the best example I could come up with to avoid fights between my expectations and yours. But this is now driven by a lot of other reasons than inflation expectations. This is certainly not easy stuff, so dont hesitate to ask back ! Please ! genau11, I must admit that I don’t feel much need to respond to your comments as much of them as been fully addressed by dwb and Dubois. However, I find your comments that my headline is misleading very rude. My graph speaks for itself. The numbers are what they are and they show that the ECB clearly has failed. You seem to think that just because the ECB have chosen to target HICP it much be the right measure to use. I think the ECB has completely failed and the failure is rooted in the fact that it has target an idiotic price index. And frankly speaking I also find your view that my comments is a “pretext for breaking the Maastricht treaty” highly offensive? Who say that the Maastricht treaty in any sense make sense? Secondly the Maastricht treaty is not saying anything about the ECB should target HICP. That is just the way the ECB has chosen to interpret the Maastricht treaty. But anyway my blog and blog post is not about “real politics” – it is about monetary policy issues. Should the Maastricht treaty dictate what we can debate or not? You apparently do not realise that the ECB is the main culprit in the present European crisis. The ECB hiked interest rates in 2008 and again twice in 2011. These are massive policy mistakes and the results have been near catastrophic. I find it hard to think anything else. LOL, you really let me jump through all the loops ! Actually a good thing !. IF consumption would be 80 % oil, the HICP would still be correct. I assume it would come mostly from the outside, and would not show up on the income side as well. That would make a big difference. would in this extreme situation not make sense. But Oil consumption is not 80 %, but only 2.5% GDP for DE and 2.8 % for EU. And this is now twice of what we had a few years ago. average raise of oil prices over the last 10 years 8%, last 2 years 17%. even without a typical filtering through factor of 2. Makes a difference of 0.2 / 0.4 %, with filter factor half of that. it is getting away the peoples wallet point of view. But the US consume 2x more and for the “poor” it bangs even 2x more into the budget. And that is why many people in the UDS are angry, because they say your “exclude imports” doesnt reflect their reality. And they have point, to a certain degree. with the demand to keep oil in. I have never seen in that way so far ! LOL. I did not say ““malinvestment” or “liduidation”. We miss each other here. Please try to go back to my words. I have seen in my whole life. This is not the fault of the ECB or the HICP, as long as you dont say the ECB should have ratched up interest rate way more agressively in 2004 and 2005. But in the moment, I dont think this is what you wanted to say. We had 2 quarters of “deflation”, but certainly not over a 5 year period. The tips spread of 2008/2009 were definitely not a good predictor of what came. it is your blog, and I take your feedback very seriously. there is nothing wrong with the HICP or the ECB, beyond already going too far with the LTRO. You know what the Maastricht treaty says, no bail out, no money printing, you know that many people now want to break it. they never ever agreed upon. The treaty was written specifically to prohibit this. I believe you that you don’t want to do this. The Maastricht treaty does not prohibit any debate in any way, but it sets clear limits to what we do, without treaty changes. In the moment we give up the rule of law in this instance, everything else breaks down too. This is not some little silly event of Denmark blocking the borders for a few days. It was written this way for very good reasons, and we would have never accepted to give up our deutschmark otherwise. And I think you know this. The little rate hikes of the ECB are not the culprit of the 10 % structurally mismatches. Do you really believe that ? I fully respect your very different views about monetary politics, but what we do in Europe has to be within laws and treaties. You then agree that import prices do not send the correct signal for monetary policy, it is only a question of degree / materiality. I was using oil as an example: to be correct you should adjust for all import prices. Lars point is that the gap between the GDP deflator and the HICP is in fact mostly due to import prices (and taxes, which are probably small). This is a common misperception. The Fed targets *headline* PCE inflation (technically flexibly targets, but set that aside). However it looks at the “ex energy” component because headline reverts to core (ex-energy) over time. That is, the *core* are the stickiest prices and best reflect the true trend. i dunno, hard to say, have not seen the demographics. houses are not ipads, people have to live *somewhere*. In the US, the population of 20+ yr olds grows at ~2.3 million per year we are only building 700k houses, most people think that we will revert to 1MM or so once we are back to normal. demographics drives the Q, mortgage finance and nominal income drive the P. I dont know how that translates to Spain but my experience with real estate “bubbles” is that its always about the P, never the Q. The HICP is sending the correct signal for monetary policy. But as everything in real life, it is not perfect, see for example the OOH discussion, and it is not the only thing going into the ECB decision making, see the Government Council link above. And it is not any kind of exact algorithm, also many people try to fit Taylor rules to the ECB and the FED, with some success. See in the EU inflation link the inflation spike begin of 2008. This was certainly not matched 1:1 with the interest rate. People dealing with federal bank models like the FRB/US or the EU SDGE go this a few steps further, “rational expectations” of key players is the key word here. And a lot of people are mocking these efforts as vanity. I say these efforts are useful, but people should stay very sober with there expectations for too much precision. I have seen this too often, that people built huge systems of equations, with then one extension after the other, instead of accepting certain limits of accuracy and keeping to simple rules. And I can built sytems of hundreds of highly dynamic differential equations. With your PCE comment, I think we pretty much agree, how this inflation triggers work out over time. For what happened in Spain, there is actually a pretty clear desciption at the begin of the wiki 2008–2012_Spanish_financial_crisis, Property bubble section, unfortunately without citations. Together with the wiki Spanish_property_bubble a pretty scary picture. 13 % still empty: http://www.thetenerifeforum.com/showthread.php?104021-More-than-3-million-empty-houses-in-Spain-! My estimate would be that the prices would have at least 30 % further to drop. And dwb, with your US based picture, be aware that there no such thing as non-recourse ! There is a tsunami of non-performing loans still to come, people outside spain believe. So far the official rate is just 3 %, I believe. With a population growth rate of 0.6% which is actually high for Europe, how long to work the inventory off ? And they scared of foreign house buyers with shenanigans about missing building permits for 20 year old houses. http://www.economicsinpictures.com/2012/04/spanish-construction-employment-from.html and typically there goes about a factor of 0.5 other jobs with it. And this will further drop. http://www.census.gov/construction/nrs/pdf/newressales.pdf (where are your 700 k from ?) since 4 years. 6-4 month x 4 mio total sales per year = 700 k surplus left. I think most people think that the US is pretty close to the bottom and markets will clear in about a year. a) Dutchess County in the mid 90ties, IBM shrank the number of employees from 40 k to 8k, in a county with 260 k people, cough. b) we had a construction boom in the early 90ties in Eastern Germany, driven by fantastic forcasts and tax incentives. you see this only partially in http://www.slideshare.net/genauer/house-prices-12869340 Now we are below 5% empty in Dresden, because we demolished thousands of old homes, Dresden grew again by more than 10 % people, biggest increase in all of Germany. And we managed to screw the hedge fund “Fortress” big time with the Gagfah deal, we are debt free ! But for Saxonia in general 17.6 % empty. http://www.dr-winkler.org/aktuellethemen/stadtumbau/wohnungsmarktprognose2020/index.html Can you imagine what that means ? yep, i understand recourse/non-recourse. The US is actually very complicated, 50 different housing markets. Some states are recourse, some are non recourse, and some are both (before 2009 in nevada a loan is recourse, after its non-recourse). The US is like 50 different countries in many respects. I have to read up on Spain, thanks for the links! political decisions are the very most of the times something gentlemen can ” agree to disagree”. Absolutely no problem with me here. Some decision (basic rights) are settled by law, but the vast majority of decisions should be settled by the appropriate majority. your housing “starts” link of 700k is too far away from my 350k “sold” link for me to ignore this as “noise”. Followup is needed. But for the discussion here, this is not really relevant. Your US market will be somewhat alright in 1 or 2 years. Very sadly, we can not say this for Spain. I mentioned this “non-recourse” as a typical thing, where most of the people simply don’t understand how things work in other countries, like with Sumner, what “long term unemployment” means in the US versus in DE. To cultivate better mutual understanding,and why we Germans are so sure with “Ordnungspolitik” 🙂 Without the background, it looks plain crazy for most US folks, I do know this ! One more thing, as a European I am very aware, that I am not telling other nations, you do this, and you do that, even with a lot of detailed knowledge. We have fought long, bitter, and very bloody wars about “not being told”. The more I very much dislike arrogant and ignorant US ivory tower folks like Krugman, deLong, Chicago school and so many others to try doing this. US economists and bankers abroad have a long and bitter trail of failure: Argentina, Russia, Mexico, Greece. I do not let them into my house. well, I hope kantoos is not off to a long weekend before releasing it. why should the German tax payer be liable for that ? with the Maastricht treaty specifically prohibiting this ? yep, economists have many opinions. i agree some institutions have delivered some bad advice. however, i would look at it scientifically and neither accept or reject it until i see if it fits data or not. maybe its right, maybe its not. “why should the German tax payer be liable for that ? well, this is a very hard question.I appreciate there is no process where German voters get to vote on Spanish laws and vice-versa, no Federal authority as in the US i cannot really answer this for you but let me say, first, people respond to economic incentives there is no “bad” or “good” here (when Germans and Spaniards come to America they respond to the same economic incentives). It is best to apply an unbiased clinical eye. You cannot say an entire country of 50 million people was “collectively bad.” or irresponsible. You must ask, as an economist, what happened: prices went up when money flowed in and then they collapsed. Nobody really benefited from either the increase or the collapse, some extra homes got built that’s all. And by the way, the same thing could happen in Germany, no one would say Germans were irresponsible they would blame the ECB for inflation. Unfortunately mich money flowed in which created a property bubble. In the future a system needs to exist to prevent asymmetric inflation. When property bubbles collapse, banks collapse and delinquencies are high. Second, treaties and contracts can be made and they can be broken (when one or both parties feel the cost is too high to stick with it). I have seen many contracts in business, companies walk away all the time if the cost of sticking to it is higher than tearing it up. It’s just paper: agreements are only as good as the incentive to stick with it. Forget the past, the cold question is: “what do i get if i accept this” vs “what do i lose if i do not.” I think Spanish and Italian banks already owe German banks much money, so the German taxpayer may already be losing money if Spanish banks fail. Sometimes there are no good solutions, only less-bad ones where you minimize losses. i cannot answer this question for you but my advice is to look at which alternative means that you lose the least money, maybe. I do know that voters reject unemployment, and wages are sticky. If you want Spain to stick with the Euro you must give them a path to growth, which likely involves easier ECB policy. If you want Spain to leave, the German banks may lose a lot of money when the (peso?) devalues against the deutchemark. I do think you should decide soon, or the decision will be made for you. well, if I let a little steam off here about US economists & bankers, I think nobody gets hurt. But I should have formulated a little nicer with respect to Lars, it did hurt him, apparently. I think it is the same with “development aid”, where naive, pampered kids from rich countries, do-gooders, think they have to tell the poor folks, what to do, and how do it. And this fails nearly always. 30 years ago, in a discussion with a teacher, I was also on the other side, and outraged, when he said, just cut this stuff. and you will find, that a lot of things work very differently from what spoiled western kids think. Sooo, I am very careful with telling others “what to do”, except telling US folks to do the same, LOL. I did not use “liable” in a moral way but strictly financially. Your are right with “people respond to incentives”. And Germans are not “better” or more intelligent than others. to IBM engineers in upstate New York. I do not blame the 99% of Spaniards, who did not have the slightest chance to see the bubble. Some 0.1%, I do blame. As in the US. IMF Rules and models for debt sustainability analysis are not new, the appropriate people should know them very well. and who owes what to whom, and I did think at this time, who cares what one US bank does with the other, it is not our money. on the Papuas and the people in our countries. Bad things can and will at some point happen in Germany as well. We had our very expensive problems with reunification. And when we get into the next global recession, people will find, that they dont really need a new Mercedes every 5 years. And if they can not even sell, what they produce now, they have no need for shiny new German production machines. We know that very well. And I have seen my fair share of people walking away from the contract, too. This discussion is about the money, and lots of it. in order to avoid taxing the hell out of rich Greeks, and Italians. You are, first step, right about: think about the future. When the Greeks go bankrupt, the ECB will lose a lot of money, and we our share in this. But the alternative is endless blackmail and much higher losses. This is now very sure, these were not “verbal misunderstandings”. Greece would have had to make hard decisions until begin of June, and they made sure, that there is now nobody who can make them. Nobody wants to be responsible. When our dutch neighbours, found, that the ruliing majority does not agree on the cuts needed to stay with the 3 % limit, they went for new elections. Nobody would care in the moment, if they violate this a little bit, for a short time. But the last thing their parliament did, was to make laws getting them back into the 3%. Disciplined central Europeans. The ECB policy is already extremely easy, 1 % rate and a trillion LTRO. This was actually used to disentangle the bank / national balance sheets a lot. When people do an unilateral restructuring they hurt the whole rest of Europe and not just Germany. If they screw up with the IMF, the rest of the whole world will hate them. And it will hurt themself a lot more. Thats why the Maastricht treaty and all these subsequent funds were done their way. To not let the debtor turn the table and get his blackmail credible. Voters always want more, and really hate significant cuts. Here too, but we got through. And so many others so often before. Germany is actually the rare exception in avoiding “crisis”. After the last 2 wars, we really try hard to avoid this. You in the US have your financial correction still before you, with a budget deficit of 8%. This will get a lot rougher. And I think the most people in Europe know this, and in fact appreciate this. We will not stay most popular, but still very high. Portugal and Spain elected conservative governments. Italy kicked out Berlusconi. Portugal and Ireland are very punctual on meeting the IMF targets and are praised for it. and who is a tantrum throwing firebrand. beyond just continuing running up debt for consumption, which makes bankruptcy certain, or very high and sustained inflation. But I am curious for references ! Those who think they can not live with the treaty like it is, shall make proposals, how they want to leave it. and they have excellent financial scorecards. and so many more things. We have lots of good and responsible friends and neighbors here. We will not let Greece screw up the monetary union again. See Lar’s excellent comments below. I left comments at the other blog as well (if you have not seen Orphanides or McCallums papers, nominal gdp targeting performs better than inflation targeting, although i’d like to see a study for the ECB). I want to add 1) you cannot judge monetary policy by interest rates because we have no idea what the “natural” real rate of interest actually is. you can only judge it by nominal aggregates (and inflation expectations). No: your conclusions about delinquencies and defaults is wrong. Defaults and foreclosures mean that savers are losing their money slowly (writedowns). In the US we have a saying “you cannot get blood from a stone.” Unemployed people cannot pay their debts even if they want to (actually: 70% of underwater homeowners in the US continue to pay as long as they have a job). When the banking system is suffering under heavy foreclosures, you have to decide “do i want to lose money this way” (high UE) or “do i want to lose my money that way” inflation. *not losing money* as a saver, is not a choice. Whether you realize it or not: the money has already been lost. gone. the equilibrium is when all debt contracts have been written down to market. This is unavoidable now. the only thing that can accelerate it is more inflation. I realize this seems counter intuitive, but a small amount of inflation actually *prevents* delinquencies and defaults by reducing the incentive to default and reducing cyclical unemployment. See 1: below. Here is a paper on the impact on corporate bond prices when the the US went off the gold standard. despite the expected higher inflation, bond prices went UP. The difference in my opinion is that there is an enormous *additional cost* of people leaving the Euro if the Euro breaks, along with substantial flight of capital. I agree that Greece has serious issues. I agree Greece should have never been let in. However, the damage is done and cannot be undone (and the ECB is complicit here). However, once one country leaves, Spain, Portugal, Ireland, and others will leave too (who knows, maybe they will set up their own currency bloc). Is It Better to Forgive Than to Receive? This paper examines the consequences of large-scale debt relief during the Great Depression in order to examine theories of debt overhang and the costs of bankruptcy. When the U.S. went off the gold standard and devalued the dollar with respect to gold, the government declared that the courts would no longer enforce gold indexation clauses which appeared in virtually all long-term private and public debts up to that time. If the gold clauses had been enforced, the debt burden of borrowers would have increased by the extent of the devaluation, which was 69 percent. I examine asset price responses to the Supreme Court’s decision to uphold this effective debt jubilee. Equity prices rise, but more surprisingly, the debt relief also led to higher prices for corporate bonds (all of which contained gold clauses). In contrast, government bonds with gold clauses fall in value. These responses suggest that the benefits of eliminating debt overhang and avoiding bankruptcy for private firms more than offset the loss to creditors of some chance of trying to recover the additional 69 percent. Consistent with large costs of debt overhang and bankruptcy, in the cross section, stock and bond prices of firms closer to bankruptcy rose more than other firms. The results suggest that in these circumstances it is indeed better to forgive than to receive. genau11, I can’t comment on all you write but I have one general observation. You seem to think this crisis is a result of something else than a monetary contraction. Market Monetarists including myself think that this crisis is a result of an insane tightening of monetary conditions in both the euro zone and in the US. Nominal GDP is determined by central banks. It is only the ECB and nobody else which determines NGDP in the euro zone. 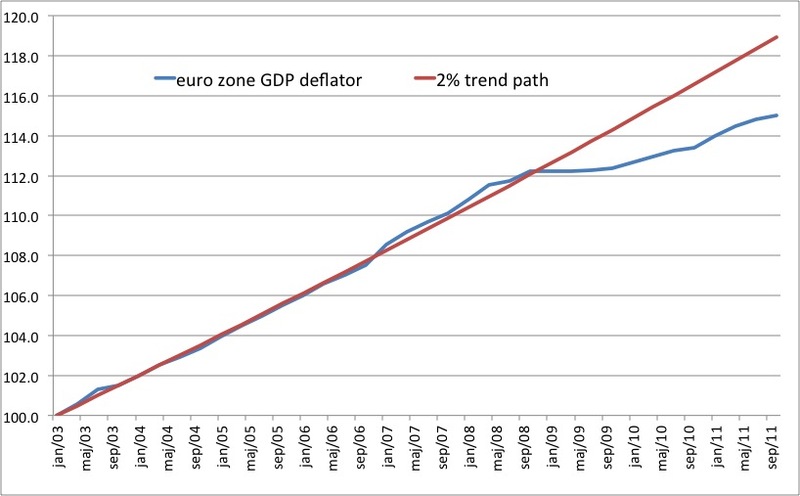 As a consequence the drop in the nominal GDP in the euro zone is the making of the ECB. Real GDP is determined by supply factors in the long run (the Phillips curve is vertical), but in the short run real GDP is mostly (at least at the moment) driven by monetary factors. The crisis is not a result of an overly generous French pension system, insane firing and hiring rules in Spain and Italy or a bad Greek tax system. The crisis for primarily caused by a massive drop in NGDP in the euro zone and the US. If the ECB brought back NGDP to its pre-crisis trend this crisis would come to an end. The ECB should NOT bail out any governments or banks. The ECB should only ensure nominal stability – something it has utterly failed to do since 2008. Unfortunately the Bundesbank is playing an very negative role in this crisis, because the bank apparently fail to understand the monetary causes of this crisis. That is too bank given the strong monetarist traditions at the Bundesbank. If Jens Weidmann would study Anna Schwartz and Milton Friedman’s account of the Great Depression then he might be able to understand the present crisis. Concerning Germany I don’t think there is any reason to think that the government has delivered. Germany has again and again broken the Maastricht rules. Just look at the present public debt levels in Germany – it is well above 60% of GDP. Furthermore, the country is over-taxed and over-regulated and still have very rigid labour market rules and militant labour unions. Germany’s growth performance of the past two decades have certainly not been impressive. Gemany in that sense is average-European. I am not asking the German tax payers to pay for any bail outs of countries and banks. I am strongly against that kind of thing. However, I do strongly oppose the idea that we can get reforms in Southern Europe by forcing crisis on Europe through an insanely tight monetary policy. All indications are that monetary policy is very, very tight. M3 growth is well below the ECB’s old reference rate for M3 (apparently the Bundesbank does not look at it old favourite measure of monetary policy anymore…). Market expectations for inflation on all time horizons are well below 2%. The GDP deflator has grown significantly below 2% since 2008. Nominal 10-year German bond yields are approaching 1%! Velocity has collapsed. Unemployment is massive high across Europe.